Everything is more fun on a stick, right? 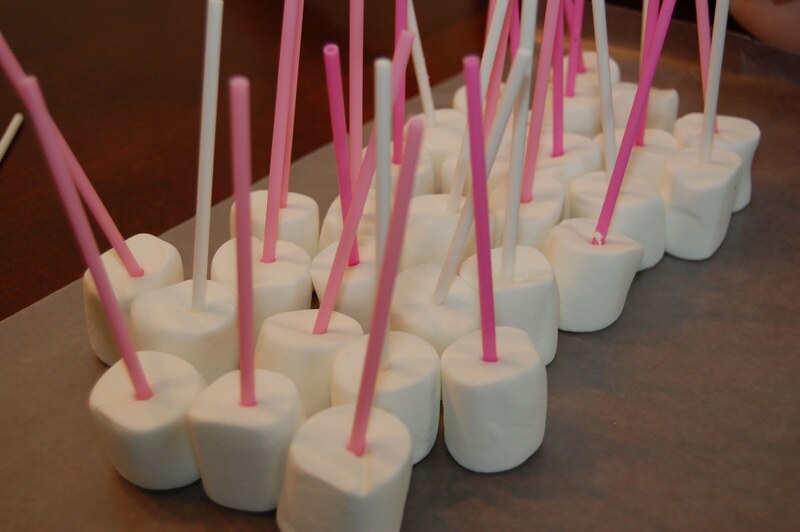 These candy-dipped marshmallows were a big hit with the kids, as well as the adults that would admit it, at my son’s birthday party. And since the occasion came up yesterday to make them again, I thought I’d show ya’ll how it was done. 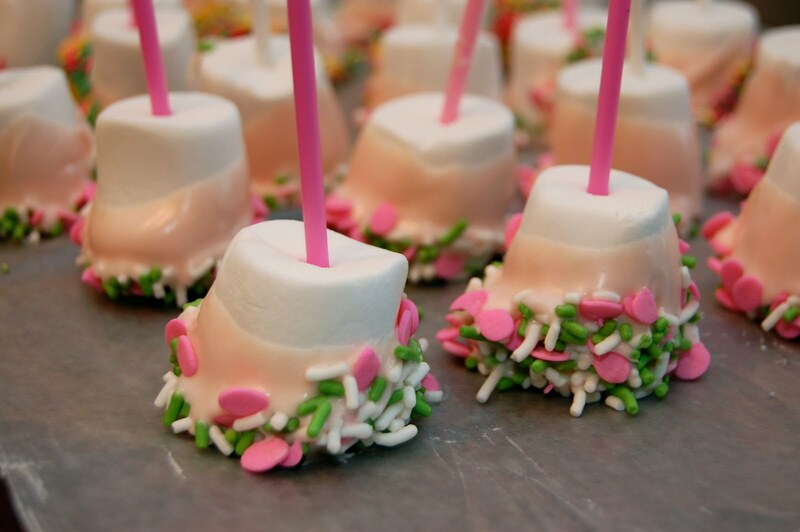 These marshmallows-on-a-stick are really easy; my daughter and I made them in about 15 minutes (30 of them) before she went to school yesterday. Assemble your ingredients (candy melts, large marshmallows, sprinkles and 4.5 inch lollipop sticks) and lay out a nice big sheet of wax paper over your work area. 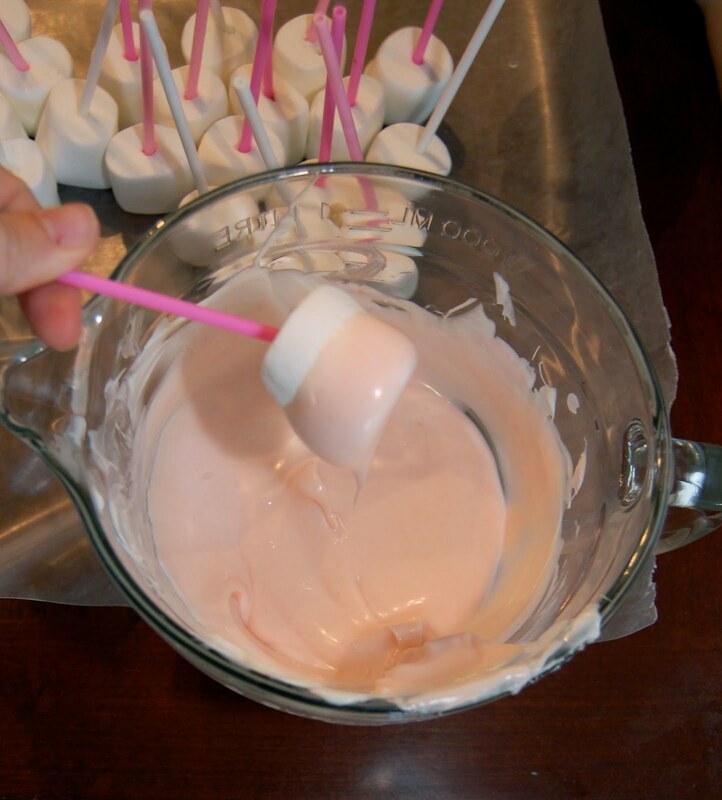 One bag of candy melts will make about 35 marshmallows. On this trip to the store, there were only white candy melts, so I used two drops of red food coloring to tint it slightly pink. I wouldn’t recommend this method, as you’re more than likely to destabilize your candy melts and make the whole batch unusable if you add too much–better to buy them pre-colored! First thing, prep all your marshmallows so they’re ready to dip. 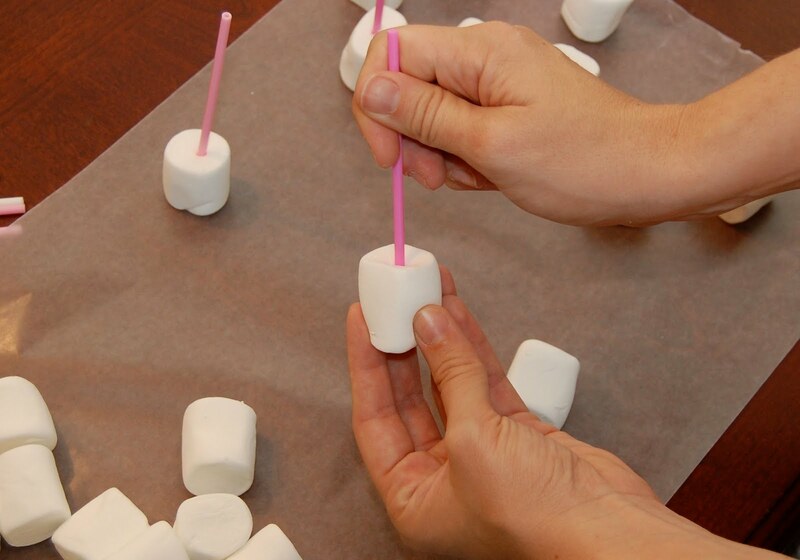 Simply take the lollipop stick and insert it to about the midway point in your marshmallow. I personally don’t have patience for double boilers and all that when the microwave works just as well. Dump the whole bag of candy melts into a deep, narrow microwavable bowl. Nuke for 60 seconds. Stir. If the candy isn’t completely melted, zap it again for 30 seconds. 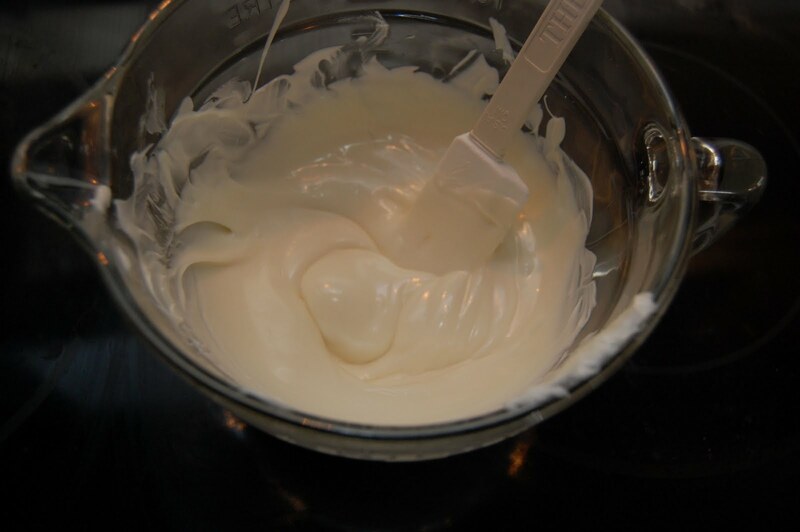 Continue for 30 seconds at a time until it is creamy smooth. This is what your candy melts should look like. Now we’re ready to start dipping! I dip the marshmallows to about halfway down. 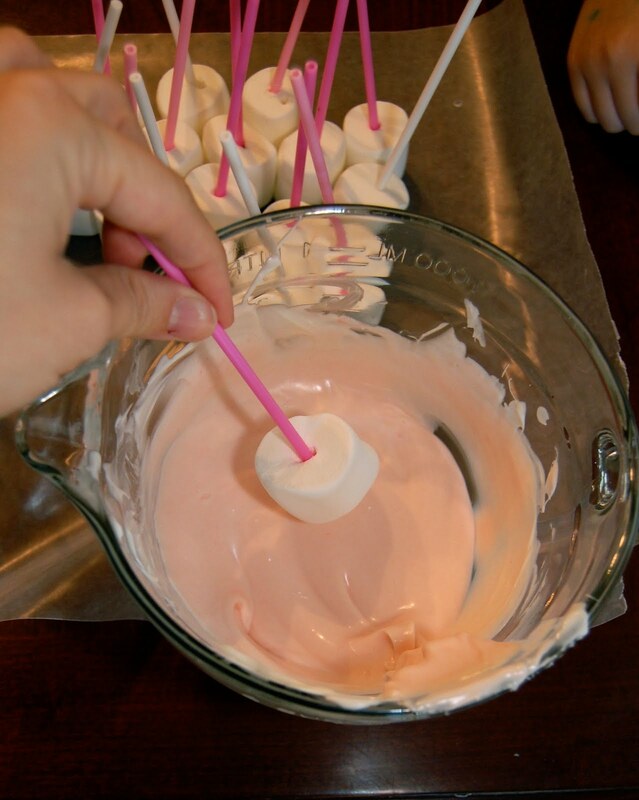 If your 4-year-old has “helped” you put the sticks in your marshmallows, before you dip, make sure your stick is securely in the marshmallow, or you may have potential disaster on your hands. Live and learn. After a quick dip, I let the extra candy melt/chocolate drip off the marshmallow for just a second. 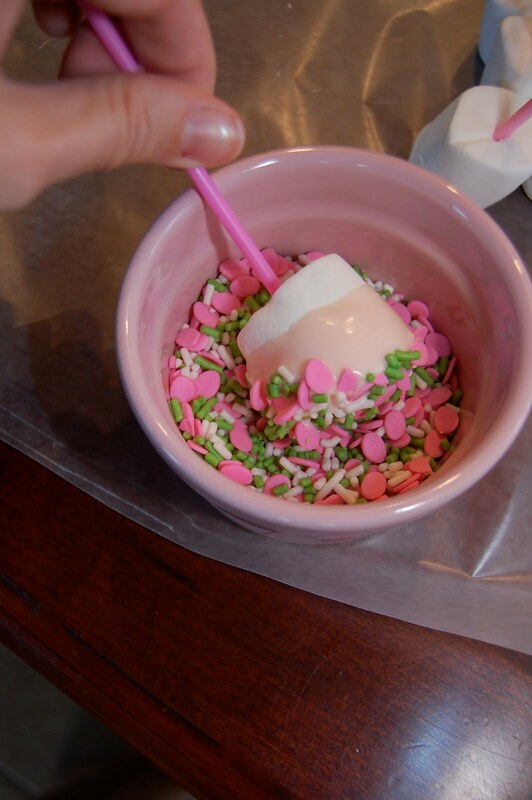 Give them a quick roll in sprinkles, or for a lighter touch, sprinkle the sprinkles over the top of the candy melt. 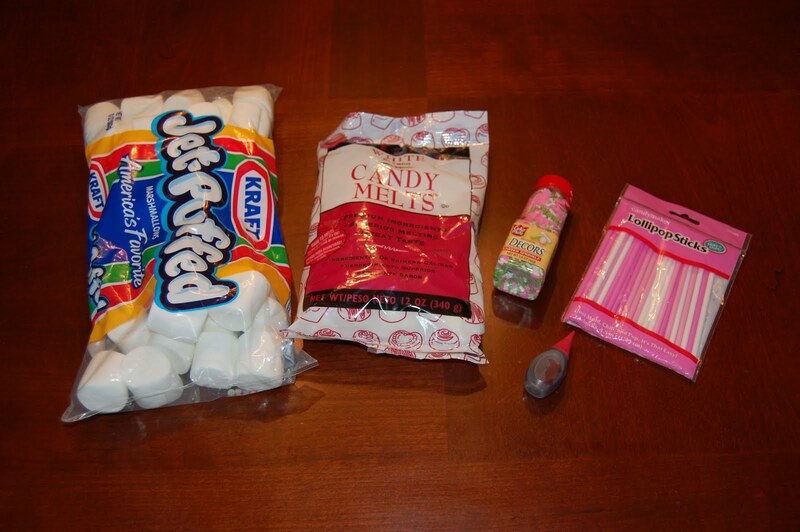 Put your completed marshmallow on the wax paper and let the candy reharden. You want to work quickly with the melts, as it does firm up quickly. After the candy is set, they’re ready to serve or bag up for favors with a party circle and some ribbon! 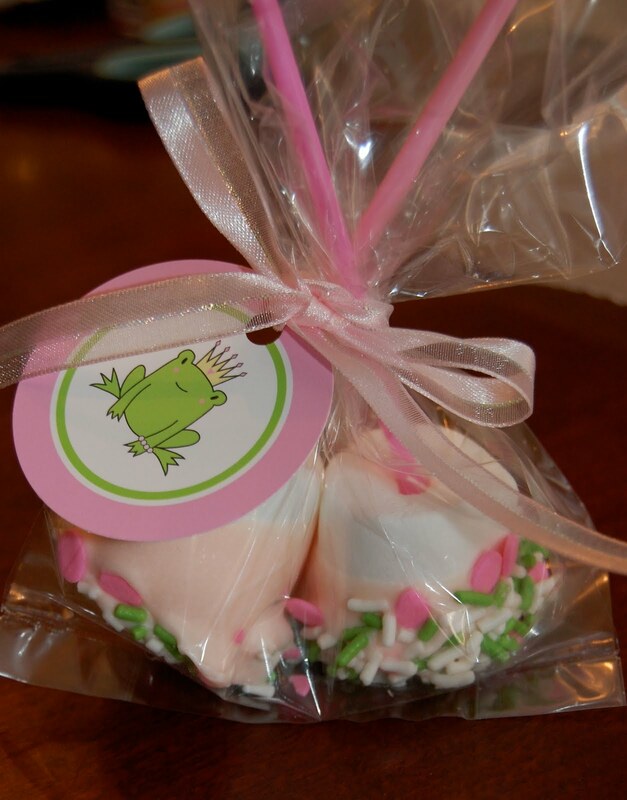 We also made chocolate dipped oreos for the Frog Prince Party–you use pretty much the same method as shown in this post. And if you want to be super fun and put them on a stick, you can check out this tutorial here. These look great! I've made these with crushed peppermints and they were well received (I didn't try one, for shame!). Thought they'd go nicely with hot chocolate. Thanks! I particularly like the part about a 4 year old helping…I know what that's about! Oooh…peppermint sounds great! I'll have to try that once winter rolls around again! The paste colours (icing colour) are by Wilton in 28.3g (1oz) jars and under $3.00 andgo a long way. Alternately, pink and yellow and a lot of stirring make pastel orange? Make sure the ratio is one pink to two yellow or you'll get a yucky color. I used a bag of white and a bag of darker blue to make the right color for my son's party…maybe it will work here?? Thanks Paula! I've seen the colored candy melts in Joann's and Michael's, but thought that it would be better to make my own….but obviously I was wrong! And what a great idea mixing colors together. Who would have thought!?! ;o) It think next time I'll stick with the colored melts! Hello sweet Paula – I am so glad I found your blog (via Google search for dipped marshmallows!). I'm a new follower and will enjoy coming back for visits. 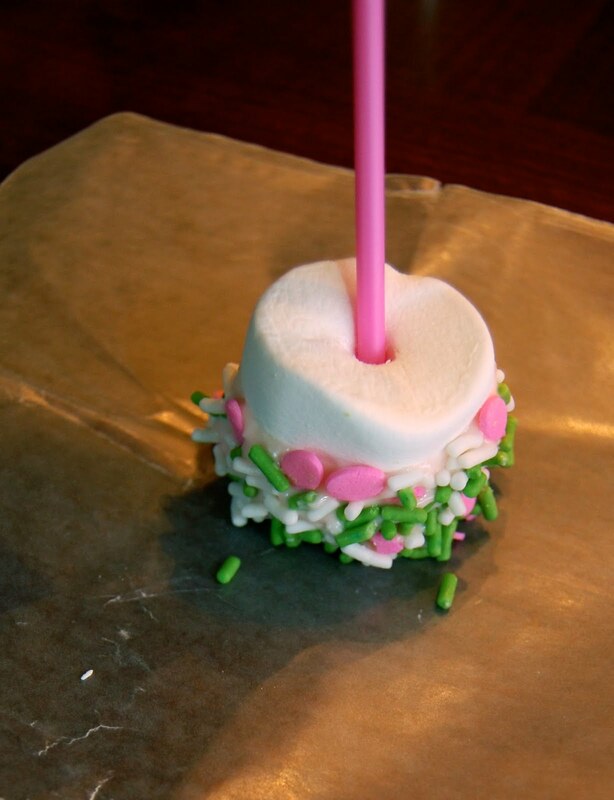 I'm hosting my daughter's 6th birthday party this Friday and needed a "how to" for the marshmallows on a stick. Thank you for the easy tutorial! We're doing a "cooking" theme. Hello, I want to purchase the pink frog tags. Where do I find them??? Too cuute! I love the idea!! It’s perfect to make for my son’s 1st birthday party! Thanks so much for the inspiration & idea! Love love love it! I enjoy reading all e comments !! !its great n i shall try to make them tq!!! How far ahead do you think you can make these? If I was serving them at a party rather than bagging them, how would you store them before putting them out to serve? A day or two is fine! And you’ll need to store them in an airtight container so they don’t go stale. Do you have to use the candy melts? 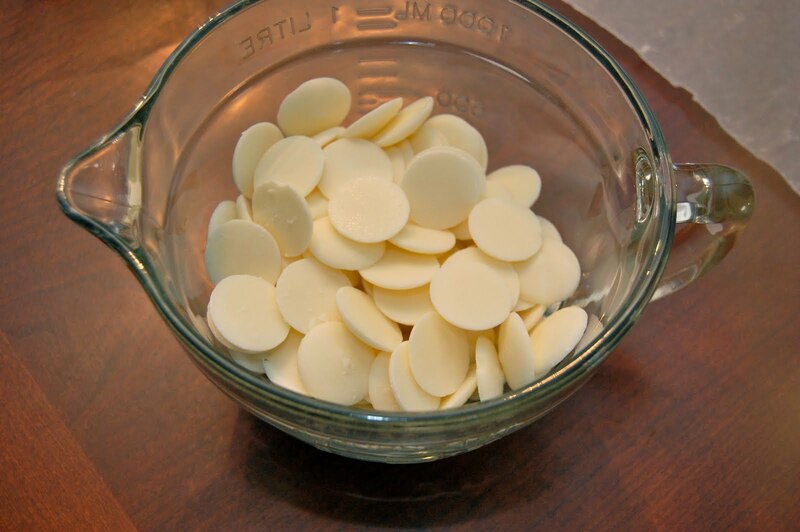 Or will melted white chocolate chips works just as well? Chocolate chips have really different melting properties than the candy melts, but they are certainly something you could use if you temper them correctly! Dip like you would a chocolate covered strawberry!